Windows Vista Upgrade - Secret! In this article I talk about it and the possible legal implications! What Is The Windows Vista Upgrade Secret? Well to be honest it is no big secret as you can find this information anywhere online and many Microsoft staff must also know about it as they created this process! The "secret" is that the setup program (setup.exe) in Windows Vista's upgrade version will accept an installed copy of XP, W2K, or an un-activated copy of Vista itself as evidence of a previous installation. ...and it is this last option that enables you to perform a "clean install" of an upgrade version of Windows Vista to any formatted or unformatted hard drive! Basically you are installing Windows Vista twice to take advantage of this trick. Is This Windows Vista Upgrade Secret Legal? BUT Microsoft have created this process.... It is not something you have to try and crack in their software or run a third party application to perform this process... Their development team created it. Which kind of begs the question WHY? So I offer this information AS-IS, and I take no responsibility for what you do with this information! 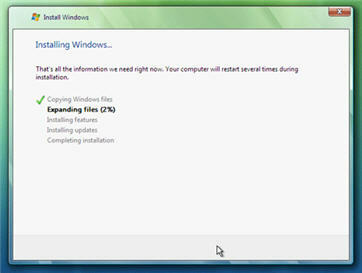 Follow These Windows Vista Upgrade Steps. #1) Grab your shiny new Windows Vista "Upgrade" DVD and "boot" your PC from it. #2) Select "Install Now" button but DO NOT enter the Product Key from the yellow sticker on the Vista packaging that holds the DVD. Also, make sure the "Automatically activate Windows when I'm online" box has NO tick in it! In the next dialog box that appears, confirm that you really do want to install Vista without entering a Product Key. #3) Now from the list on the next screen you must select the version of Windows Vista that you're installing: Home Basic, Home Premium, Business, or Ultimate. 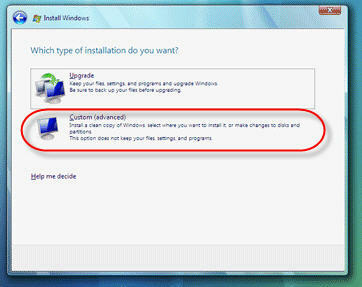 #4) On the next screen select the "Custom" install, not the "Upgrade" install option. #5) Windows Vista will now copy all the files it needs so sit back and relax for a few minutes! Please note that the PC will reboot automatically several times. At this stage of the installation DO NOT attempt to "activate" Windows Vista, that will come later. Now the installation is complete move onto the next step. #6) We now need to install the the Vista upgrade files... To do this place the DVD in the drive again but DO NOT try to run the setup again from the DVD. Instead logon to Windows Vista using the account you just created and from My Computer run the DVD's setup.exe program. 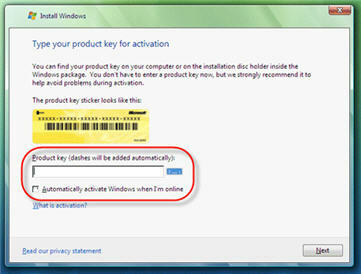 #8) On the next screen you CAN now enter the Product Key from the yellow sticker on the Vista DVD packaging. But make sure you TURN OFF the option "Automatically activate Windows when I'm online." You will be asked to boot from the DVD - DO NOT do this! Instead, wait a few seconds and the setup process will continue on its way. You will notice some character mode menus appear, just IGNORE them! Now just enter the username and password that you selected during the first install and you are finished upgrading to Windows Vista! #12) All that remains is to activate Windows Vista within the next 30 days. Failure to do this will mean you will lose most functionality of Vista. To activate Windows Vista simply click Show more details in the Welcome Center that automatically displays upon each boot-up, then click Activate Windows now. If no Welcome Center appears, access by doing this: Start - Control Panel - System & Maintenance - System. I offer this information AS-IS, and I take no responsibility for what you do with this information! To Instant Vista News Yet? 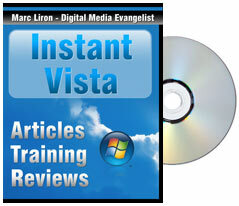 I hope you find this Windows Vista Upgrade article useful? Windows Vista Video Minute Yet?